To prepare cookies, lightly spoon flour into dry measuring cups; level with a knife. Combine flour, baking powder, and salt, stirring well with a whisk. Place granulated sugar and butter in a large bowl; beat with a mixer at medium speed until light and fluffy. Beat in 1 1/2 teaspoons vanilla and egg whites. Gradually add flour mixture to butter mixture, beating at low speed just until combined. Divide dough in half. Shape each dough half into a ball; wrap each dough half in plastic wrap. Chill 1 hour. Unwrap 1 dough ball. Press dough into a 4-inch circle on heavy-duty plastic wrap. Cover with additional plastic wrap. Roll dough, still covered, to a 1/4-inch thickness. Repeat procedure with remaining dough ball. Chill dough 30 minutes. Remove one dough portion from refrigerator. Remove top sheet of plastic wrap; turn dough over. Remove remaining plastic wrap. 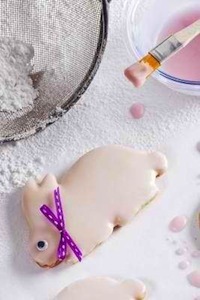 Using a 2 1/2-inch cutter, cut dough into 18 cookies. Place cookies 2 inches apart on baking sheets lined with parchment paper. Bake at 375° for 10 minutes or until lightly browned. Cool on pans 5 minutes. Remove cookies from pans; cool completely on wire racks. Repeat procedure with remaining dough half. To prepare icing, combine powdered sugar and remaining ingredients, stirring with a whisk until smooth. Working with 1 cookie at a time, spread about 1 teaspoon icing evenly over cookie. Let stand on a wire rack until set.